I am sorry for not visiting this place for a long time. I have been busy on Facebook, as you might know. Recently I started a new Vlog project. Please, visit my blog to see the results. Cheers. Some time ago we talked with Mirosław "Tycjan" Gucwa on the "Gamedec" Board Game. Here you can read the whole interview. I also talked to Mikołaj Dusiński on cdp.pl blog. The interview was so long, it had to be cut in half. Here you can find the first and the second part. Let's sum up the videoreviews of the "Gamedec" Board Game. Gildia, Twój Ruch, introduction by Game Troll, Review by Game Troll, Gameplay by Twój Ruch, Unboxing - Z Kartonu, and here is a videopresentation of the rules of the game. If you don't like reading reviews, here you can watch one. Krzysztof Woźniak talks about "CEO Slayer". It is not a common thing that a book of a younger writer is reviewed by an older, legendary master, whos books the younger one read as a teenager. This time it happened. 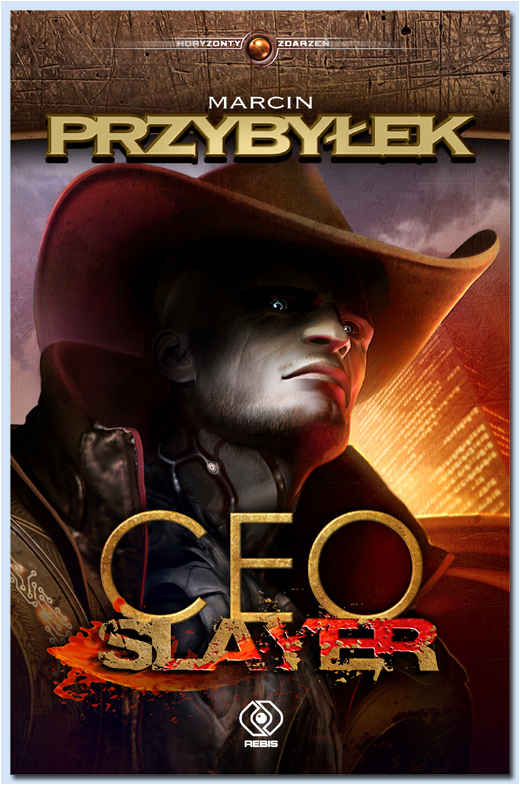 Marek Oramus read and reviewed "CEO Slayer". Well, there is much missing news. Please, accept my apologies. I will try to make it up. For the start - CEO Slayer reviews. Qfant, Fantasta, k.s.i.ą.ż.k.a, MK Czytuje, Dzika Banda, Zaginiony Almanach, Co przeczytać?, Fahrentheit, Nie samą pracą... These are the most important, I think. There were also two interviews. On Dzika Banda website I talked to Paweł Deptuch, and on MK Czytuje blog we talked with Marta Kor. Should somebody be curious, during "Horyzonty zdarzeń" (Event Horizons) event, a new s-f series of Rebis publishing house will be presented. There you will be able to see my new novel, "CEO Slayer". Cheers. On "Gry bez prądu" website you can read a huge review of the "Gamedec" board game. Enjoy! 09.09.2013 r. - The first "Gamedec" the board game review! On Ogry Planszowe website you can read the first review of "Gamedec" board game. Enjoy :). Grafika: Marcin Przybyłek, Marcin Jakubowski, Marek Okoń, Robert Letkiewicz. Wykorzystano grafiki Tomasza Piorunowskiego, Marcina Trojanowskiego i Tomasza Marońskiego.